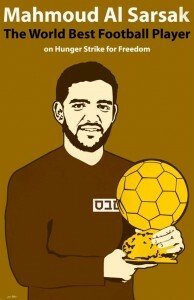 As European football stars compete in the European Championships, the eyes of the world must turn to a football star at urgent risk of death: Palestinian national team member Mahmoud Sarsak, 25, has been imprisoned under Israel’s “Unlawful Combatants Law” – the only prisoner so held – without charge or trial – for three years. Sarsak, from Gaza, traveled to the West Bank to join the Palestinian national soccer team for training. Upon his arrival he was abducted by the Israeli occupation military and since that time has been held in Israeli jails, subject to this special version of administrative detention designed especially for Palestinian prisoners from the Gaza Strip. Take action now – send a letter to Israeli officials demanding his freedom! This entry was posted in Action, Campaign, Prisoners, Uncategorized and tagged Palestine, Prisoners. Bookmark the permalink.